Man or Astroman? collectors’ site > Blah! Blah! Blah! There's a fantastic site dedicated to unravelling the details behind every Man or Astroman? release and the enormous plethora of unusual memoribilia items the band produced. It's called Man or Astroman Ad Nauseum and is a real labour of love, so if you've ever wondered how many of a particular release or what variations there were of those releases, now is your chance to find out! On the subject of Man or Astroman? 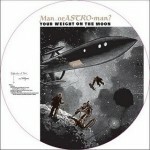 Overground Records are re-issuing the classic album 'Your Weight On The Moon' with nine additional bonus tracks on CD and limited edition picture disc.